Minecraft players know all too well the trials of having to deal with a Creeper. That pesky green creature always seems to show up at the worst times! Once you’ve finally constructed a masterpiece, like that nice 2-story house you’ve been putting together, that little green guy just drops by and blows the whole thing to kingdom come. That’s so rude… however, it does seem like it would be a pretty awesome experience to play the bad guy every now and again. Now, with this prestige costume, your child will finally be ready to reverse the roles to become the green baddie! 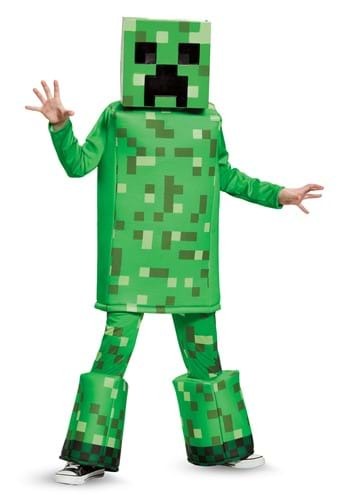 Yes, that’s right; this Minecraft Creeper costume is a kid’s costume that will have your child playing the role of the destructive green menace from the video game. It comes with everything your child needs to make the complete transformation, sans dynamite, of course (the last thing you need is explosives in the hands of your kid). The main piece of this costume has a 3-tone green blocky look to recreate the pixelated design of the video game villain. The foot covers and mask also have a matching blocky look with the green color schemes. After spending plenty of time building things in the game, your child will be totally ready to play the role of great destructor! The costume offers the perfect opportunity for Minecraft themed hijinks, so make sure you keep a close eye on your little one when they dress up in this iconic video game outfit.